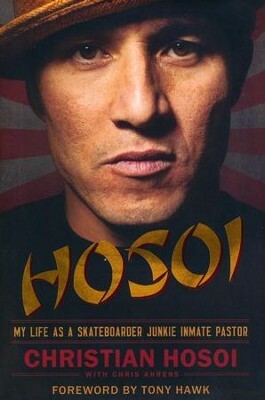 * A professional skateboarder by 13, Christian Hosoi also became a full-time meth addict at an early age. While serving five years in prison for drug possession, he found salvation in Christ! In this tell-all book, Hosoi recounts his highs and lows---and his miraculous rise to prominence in the sport once again. Includes photo insert. 304 pages, hardcover from HarperOne. Christian Hosoi is widely recognized as one of the greatest skateboarders of all time. A professional by thirteen, he went on to become an industry icon. After serving time in prison for drug trafficking, he devoted his life to Christianity. Since then, he has risen to prominence in the skateboarding world once again and was the subject of a full-length documentary narrated by Dennis Hopper, Rising Son. Hosoi is an outreach pastor at the Sanctuary, "the raddest church" in Huntington Beach, and lives in Southern California with his wife, Jennifer, and four sons. Chris Ahrens has worked as a full-time writer for nearly thirty years, with four popular books on surfing to his credit and bylines in publications that include the Los Angeles Times, The San Diego Union-Tribune, Outside, Family Circle, Skateboarder, Surfer, Surfing, and The Surfer's Journal. He wrote and directed the award-winning skateboarding documentary D.O.P.E. (Death or Prison Eventually), and served as editor-in-chief of Risen magazine from its inception in 2002 until May 2010. I'm the author/artist and I want to review Hosoi: My Life as a Skateboarder Junkie Inmate Pastor.